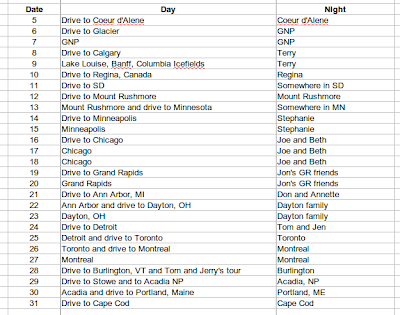 So far on this trip, we have been fairly spontaneous with our schedule. In the past two months, we only had three appointments to keep with family and friends putting us up at their place or flying in to see us so we just kind of floated where we wanted to when we wanted to. This spontaneity gave us flexibility to stay longer in areas that we really enjoyed (i.e. San Francisco and Astoria, OR) but resulted in less time for other places (i.e. southern Oregon). It also made us miss seeing some people because we didn't know we were near them until after we were gone. This month will be different. Not only are we making sure that we have time for everything and everyone we want to see, we are letting you know where we are going to be in advance. If we are going to be near you this month, please let us know! And if you have any recommendations for the areas we will be heading, let us know that as well! Hey...it looks like my comment didn't post...or maybe you deleted it? I didn't swear or anything! Anyway...are you checking your email accounts? Steve and I want to send you a list of must-dos in Toronto and Montreal (and where to stop for lunch in between). No comment deleting at all. I blame Wyoming (for no particular reason). We'd love suggestions for T & M! When are you guys getting your butts to Jersey? Snooki's waiting! We're going to plan out June soon and will let you know! Looking forward to hanging out again!! Ok, now the blog just deleted my post. Urgh. O - we are going to plan out June and the beginning of July soon and will let you know as soon as we do that! We are really looking forward to hanging out again soon!! Give us a ring when you are by Dayton. We would love to see you. Hey...I sent you a message about TO...let me know if you didn't get it for some reason. My super cool aunt can offer a shower or whatever...and some suggestions about what to do in the T-dot. @Nate - So, so good to see you! @Taben - Got the message. Thanks for the hookup!